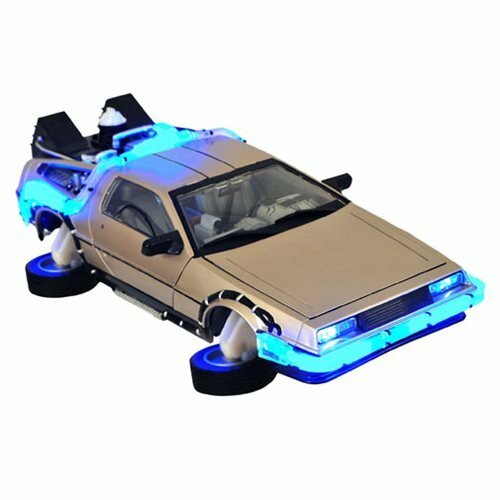 Shopping for Back to the Future Vehicles? "You built a time machine... out of a DeLorean!" Electronic lights and sounds. Gull-wing doors swing open. Wheels pop out for "flight mode"! The toy you always wanted is finally here. Based on the 1989 Back to the Future II movie, this is the best toy DeLorean money can buy. Not only does it feature classic DMC engineering (like the gull-wing doors) and Doc Brown's own special modifications, but our version of the DeLorean automobile also has the 2015 hover conversion kit. That's right, our exclusive vehicle has wheels that pop out for "flight mode"! The wheels spin, the doors open, and its plastic construction feels just like the toy you always wished you had. Don't miss your chance at owning one of America's finest motorcars ... with a special futuristic, time-traveling twist! The 13-inch long vehicle that's compatible with many 3 3/4-inch scale action figures* (not included). Please note: Upper half of Mr. Fusion part is packaged underneath the car. Full Mr. Fusion requires minor assembly. Note: While this vehicle is scaled to interact with 3 3/4-inch scale action figures like Hasbro's G.I. Joe and Star Wars lines, there are no figures for Doc or Marty planned for release at this time. * We have tested several 3 3/4-inch scale action figures with the vehicle and have found that many fit in the driver's and passenger's seats with little to no difficulty. Unusually tall figures like Darth Vader and Chewbacca will not fit, but we have had good luck with Shipwreck, Spider-Man, and many others. Depending on your figures, your mileage may vary.